Properties in Rio Grande County average 4.7 out of 5 stars. 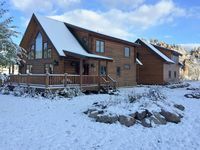 Lodge cabin with shared hot tubs - walk to dining & shopping - dogs OK! Property 2: Lodge cabin with shared hot tubs - walk to dining & shopping - dogs OK! Lovely log cabin with private hot tub & deck - dogs, hikers & skiers welcome! Property 3: Lovely log cabin with private hot tub & deck - dogs, hikers & skiers welcome! Quaint log cabin w/ shared hot tub & prime hiking/skiing location - dogs OK! Property 6: Quaint log cabin w/ shared hot tub & prime hiking/skiing location - dogs OK! Rustic, dog-friendly cabin with kitchen, private hot tub & easy ski access! Property 8: Rustic, dog-friendly cabin with kitchen, private hot tub & easy ski access! Cozy lodge cabin w/ shared hot tubs, access to year-round outdoor fun - dogs ok! Property 10: Cozy lodge cabin w/ shared hot tubs, access to year-round outdoor fun - dogs ok! Dog-friendly log cabin w/ shared hot tub & entertainment - easy ski access! Property 11: Dog-friendly log cabin w/ shared hot tub & entertainment - easy ski access! Relaxing Mountain Getaway With Gorgeous Mountain Views and a Hot Tub! Property 12: Relaxing Mountain Getaway With Gorgeous Mountain Views and a Hot Tub! On the Phipps Family Farm! Snow pack is great & Crane Festival in early March! Property 13: On the Phipps Family Farm! Snow pack is great & Crane Festival in early March! Authentic 3BR Cabin w/Wifi in the San Juan Mtns! Property 14: Authentic 3BR Cabin w/Wifi in the San Juan Mtns! Dog-friendly cabin w/ shared hot tubs, walk to dining & shopping - fun all year! Property 17: Dog-friendly cabin w/ shared hot tubs, walk to dining & shopping - fun all year! Cozy South Fork rental w/ kitchen, shared hot tubs, free WiFi - dogs welcome! Property 18: Cozy South Fork rental w/ kitchen, shared hot tubs, free WiFi - dogs welcome! Three stories of spacious living; Large decks! Property 20: Three stories of spacious living; Large decks! Cozy, dog-friendly lodge w/ kitchen, entertainment, ski access & shared hot tub! Property 34: Cozy, dog-friendly lodge w/ kitchen, entertainment, ski access & shared hot tub! Cozy, dog-friendly cabin w/ shared hot tub - 17 miles to skiing! Property 35: Cozy, dog-friendly cabin w/ shared hot tub - 17 miles to skiing! Amazing Mountain Views with a hot tub! Property 38: Amazing Mountain Views with a hot tub! Rio Oasis-Your wedding or event destination! Property 40: Rio Oasis-Your wedding or event destination! Country Cabin with Beautiful Mountain Views. Property 43: Country Cabin with Beautiful Mountain Views. Soak in the hot tub after a day on the mountain! Property 46: Soak in the hot tub after a day on the mountain! Cozy 2 Bedroom + Loft Home Sits On 6 Acres. Walking Distance To The River. Property 48: Cozy 2 Bedroom + Loft Home Sits On 6 Acres. Walking Distance To The River. On the RIVER! Great for GROUPS! Jeep rental available. Discounts for just a few! Property 49: On the RIVER! Great for GROUPS! Jeep rental available. Discounts for just a few! House looks well better than the pictures on the website, owner definitely need to take better pictures, it has a small river flows through the property and unfortunately the weather is still too cold so we did not see any green on the trees and grass. Amazing time at this beautiful cabin. Family spent a week in South Fork enjoying some skiing at Wolf Creek. Wonderful location. Look forward to coming back next season!! Thanks! !